Heat oven to 375°F. Spray 2 cookie sheets with nonstick cooking spray. Brown ground beef in large skillet over medium-high for 5 to 7 minutes or until thoroughly cooked, stirring frequently. Drain. Stir in pasta sauce. Remove skillet from heat. Separate dough from both cans into 8 rectangles. Place rectangles on sprayed cookie sheets. Firmly press perforations to seal forming 8 (6x4-inch) rectangles. 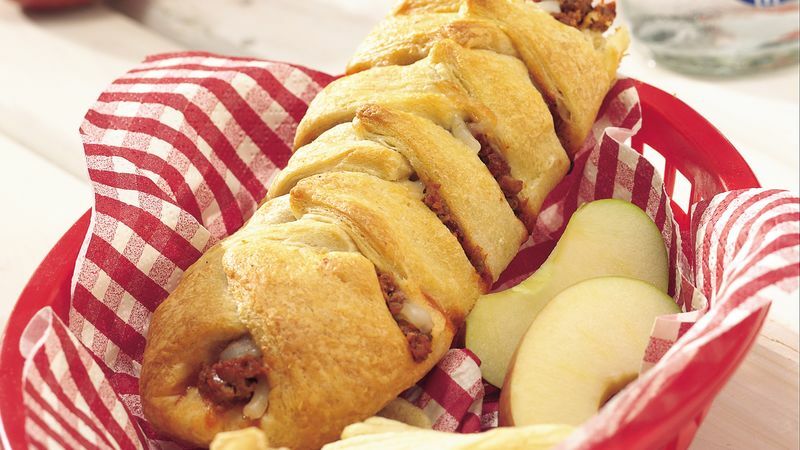 Spoon about 1/3 cup beef mixture in 1 1/2-inch lengthwise strip down center of each dough rectangle. Top each with 2 tablespoons mozzarella cheese. With scissors or sharp knife, make cuts 1 inch apart on each side of beef mixture. Alternately cross strips over filling. Bake at 375°F. for 12 to 15 minutes or until golden brown, switching cookie sheets halfway through baking time.